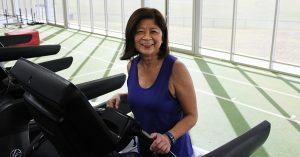 We spoke to one of our long-term members, Bee L Tan to learn more about her fitness journey at SSH+F. How long have you been a member at the gym? What motivates you to keep coming to our Fitness Centre? I very much enjoy the Healthy + Active classes, yoga, Pilates classes and the trainers – Lesley, Chris, Lorin and Danielle are amazing! I have also made a lot of new friends at the gym. I am very fortunate the classes I like are early and as I work from home, there are minimal obstacles. When I am not in a hurry, I spend more time on the treadmill and enjoy a coffee with my gym friends afterwards. I am very lucky! With it being Seniors Week, are there any suggestions you’d like to share? Always try to keep fit, join the gym and enjoy social activities. Don’t give up the things that you enjoy… if you are retired and have more time, think of things you like to do and go out and do them! I feel fitter and stronger, and my balance has improved. The gym has now become part of my daily routine. The weights I do in classes have helped me to be able to lift up garden pots and move faster overall. What was your main goal when you started your fitness journey? My number one goal was to lose some weight and feel good. Are you still chasing that same goal? Yes, I believe there is always room for improvement and I hope to continue to pursue this goal. Yes, all my family and friends have noticed that I have lost weight and look better for it. Queensland Seniors Week runs from 18-26 August and aims to enhance community connection and inter-generational relationships.